The HAWK MV-4000 is Omron Microscan’s brand-new ultra-high-performance smart camera. With its amazingly fast and flexible imaging, as well as near-PC processing capability, we have blown the lid off the range of applications this camera can handle. A brand-new, ultra-powerful smart camera is about to hit the market to help businesses in a wide range of industries streamline their operations. 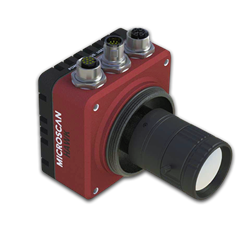 This smart camera, the HAWK MV-4000 from Omron Microscan Systems, Inc., quadruples the processing power of the previous generation. It boasts up to six times the frame rate of its predecessor, achieving real-time trigger response using an FPGA. Building upon a 35-year history of development in Automatic Identification and Machine Vision, the HAWK MV-4000 does code reading, code verification, inspection, guidance, and gauging, incorporating state-of-the-art algorithms that can serve applications in virtually any industry. Users seeking high-quality images and a high level of configuration flexibility will appreciate this camera’s wide array of sensors, ranging from 0.3 MP to 5 MP with a pixel size of 4.8 μm. The system can be optimized for almost any application thanks to these sensors in combination with C-Mount lens options and plug-and-play external lighting. Automotive applications will benefit from the HAWK MV-4000’s long-range imaging and superior field of view. The consumer electronics industry will benefit from the camera’s precision gauging and inspection capabilities. All this power and flexibility is easily applied using intuitive setup, testing, and runtime user interfaces to program the inspection and to set up communication between the camera and other components on the line. Machine vision customers have praised the MicroHAWK’s ability to reduce setup time from hours to mere minutes, and the HAWK MV-4000 is no different. The user interface is image-centric, with intuitive drag-and-drop programming. Reading, verification, and vision tools are ready to use right out of the box without time-consuming parameter adjustments. Two unique user interfaces (UIs) are available: the AutoVISION UI, intended for most operators or technicians, and the more advanced and customizable FrontRunner UI, designed for machine vision professionals. Although the HAWK MV-4000 is a smart camera rather than a PC-based device, its processing power enables speeds nearly equivalent to those reached by vision systems relying on PC processing external to the camera. A combination of extraordinary power and speed in a compact industrial package puts the HAWK MV-4000 in a category known by vision engineers as the “golden middle” between PC-based devices and the average smart camera on the market. The HAWK MV-4000 is the first product offering in this new middle tier of Omron Microscan’s machine vision products. The base-tier MicroHAWK, released in November of 2016, is the world’s smallest smart camera with fully-integrated lighting, optics, processing, and communications, and can reach speeds of 1,000 – 2,000 parts per minute. Our multi-core PC-based systems, constituting the top tier, allow you to connect up to eight GigE cameras simultaneously. The HAWK MV-4000, a dual-core, FPGA-assisted smart camera, is capable of reaching near-PC speeds with inspection rates from 4,000 – 14,000 parts per minute. This milestone in the history of the HAWK family of products has its origins as far back as 1982. That year saw the merger of ITRAN, a builder of high-speed, hardware-based vision systems for general use, and Automatix, a manufacturer of software-intensive vision systems directed towards the automotive and robotics industries. The result of that merger was Acuity Imaging, the creator of Visionscape machine vision software. Visionscape software is available in both a standard version and an advanced version, offering an array of machine vision tools in combination with the HAWK MV-4000. Omron Microscan will be offering live webinars and talks in the coming weeks to further introduce the HAWK MV-4000 and demonstrate how it can benefit businesses in almost any industry with its superior speed, power, and precision. For more information about the HAWK MV-4000, please visit this page. Omron Microscan, an ISO 9001:2008 certified company recognized for quality leadership in the U.S., is known and trusted by customers worldwide as a provider of high-quality, high-precision products. Omron Microscan is a business unit of OMRON Corporation. Headquartered in Kyoto, Japan, OMRON Corporation is a global leader in electronics manufacturing. Established in 1933 and headed by President & CEO Yoshihito Yamada, OMRON has nearly 38,000 employees around the world working to provide products and services to customers in a variety of fields, including industrial automation, safety products, electronic and mechanical components, automotive electronic components, robotics, social systems (ticket gate machines and traffic control) and healthcare. For more information, visit the OMRON website at http://www.omron.com.